John Charles Gross | The most Awesome Guy in the world! John Charles Gross was in an accident on Thursday, July 17th 2014. He lost control of his truck and wrecked into a telephone pole in Buras, Louisiana. Doctors diagnosed John Charles as paralyzed from the shoulders down and not likely to regain any other movement that he doesn’t have now. It is our sincere hope that the doctors are over conservative and that with rehabilitation, the miracles of modern medicine, and John’s strong will, he will be able to regain more function and use of his arms and legs. John Charles was born on April 26th, 1985 and at the time of the accident lived in Avondale, Louisiana with his girlfriend and baby girl. 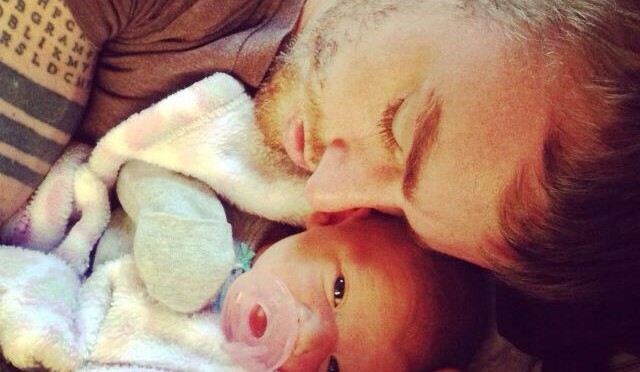 John and his girlfriend had their daughter on January 27th, 2014. He is an incredible father, hard worker, and one of the strongest men you’ll ever meet. He is a commercial diver and a great one at that. John Charles was treated at LSU University Hospital, Trinity Neurological Rehabilitation Center and Slidel Memorial Hospital in Louisiana. He was then flown, via medical transport, to Newport Oregon where Mom, Matti, Charlie, and Samaritan In-Home Health Care Services cared for him until his current placement at VIBRA Specialty Hospital in Portland. We are starting a fund for John Charles for any handicap items he will need once back in Newport. (Ex: Hoyer Lift, ramps, communication aids, ect.) If you would like to donate anything, please use the buttons below. We are thinking about you and praying your body will get stronger and stronger every day. Hang in there! Much love from the Dub Track family. I went to aveda with mattison and I never thought she would settle down so for her to care us much about you says what an amazing person you are (since I don’t know you). I will be praying for you to be healed and be regain mobility. Remember you can do all things through Christ who strengthens you. Danielle, Kenneth, Blake & Bradley. John – You remain in our thoughts and prayers! Stay strong! We are all thinking about you here in Wilmington and praying for a full recovery. Stay tough like the athlete you are and you will Soar once again soon. John, praying for you & your family!!!!!! We are praying for you and your family. Our memories of you and Brad on the UNC track are reminders that we want you to work hard and work toward increasing mobility. There’s a miracle out there for you!